Utility baseball player Dean Anna is the consummate leader. A three-sport letterman in baseball, basketball and golf while attending Lincoln-Way East High School in Mokena, Illinois, he chose baseball at John A. Logan College in Carterville and was rewarded by being named All-Great Rivers Athletic Conference during his sophomore year after leading his team in home runs and breaking the school record for RBI. Dean Anna’s leadership continued as a junior transfer at Ball State in Muncie, Indiana–where he led the Cardinals in doubles, triples, walks and runs. The Padres took notice and selected the versatile five-foot-eleven right-handed fielder/left-handed batter in the 26th round of the 2008 MLB Amateur Draft. Since then the Midwesterner has proven worthy in the Padres minor leagues by catapulting his teams to three championship titles in Fort Wayne (2009), Lake Elsinore (2011) and San Antonio (2011). 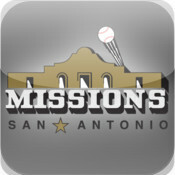 Having played in three 2012 Padres Spring Training games before being sent back to San Antonio to defend the reigning Texas League Champion Missions, super utilityman Dean Anna is making a difference in the team’s nightly do-or-die must win scenario to make the playoffs since six of the Missions’ remaining handful of games are against second-half leader Corpus Christi Hooks, who are ahead of San Antonio by nine games. After speaking with Missions’ Dean Anna, we found him to be one of the most humble players in the dugout. His work ethic is unparalleled and his ‘never say die’ approach to the game is commendable. With the Missions needing their clutch player to step up and lead the team to the post-season, Dean Anna is more than capable to take on the role as captain. Batting .282 with 10 home runs and 47 RBI, Anna’s on-base percentage of .392 is among leaders in the entire Texas League. The 25-year-old prospect is certainly exciting to watch, and we expect to see him play his best baseball yet in his quest to help his team repeat. 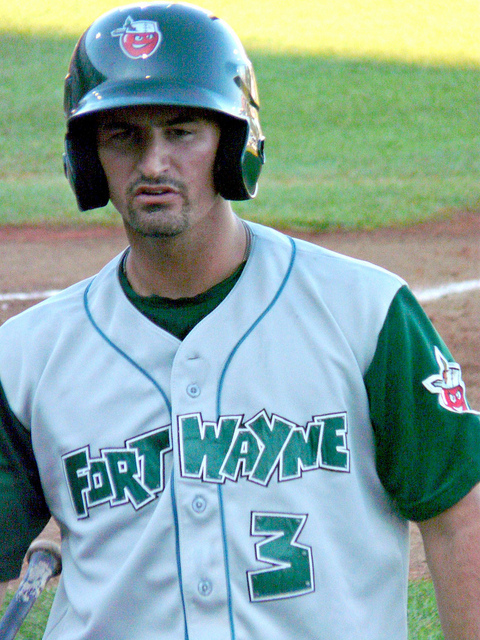 Dean Anna led the Fort Wayne TinCaps to the 2009 Midwest League Championship. Roberto: I understand you have played every position on the field but catcher, correct? Dean Anna: The only catching I have done…caught a few bullpens. If the opportunity came, I think that I would have to catch. But I haven’t caught a pitch yet. Roberto: Would you like to try pitching professionally? Dean Anna: Yeah, I would love to actually. I have always wanted to try one inning or two just to see how it is out there. Make me feel like I was 10 again pitching. Roberto: How does playing second base differ from playing shortstop in regards to turning the double play? Dean Anna: Well, second baseman, there is three different turns, you know. Second base you got a drop step, you got a flip and then you got a side flip. So I mean you just really work on your craft, you know. At first it’s real difficult when you start at second base. Because I started at short(stop) all of my career, and I moved to second when I got to pro ball. And you know I thought it would be easy, but actually it was a little hard because of all the different type of turns for double plays from throwing it from shortstop. The drop step was different, the side flip was different and the underhand flip was different. And you use them in a different type of areas. So you really have to understand what area you’re in for what ball to throw, you know. So that was the big thing. Even to turn double plays when you’re on the bag…you know there’s a way of doing it that way. It seems to look easy but wherever the ball’s taking you–you have got to go to it. And you have got to be quick as possible and get out of there because that runner is getting on you fast. So that’s another thing you have got to have quick hands. Roberto: When has a baserunner crossed the line to intentionally cause you harm? Dean Anna: You know what? If a cleat hits you, you know they’re out of hand probably. But it’s hard to tell because you can’t see the runner sliding because you’re focusing on the ball thrown at you. So both of your eyes are following the ball. It’s impossible to look at the runner while the ball is in the air and catch it at the same time. So you’re just hoping, you know. You kind of have a clock in your head so you kind of know when the runner is coming to second base. So you know when to get out of there. But sometimes it’s hard. Sometimes you forget the time of it and how fast the runner is getting on you. 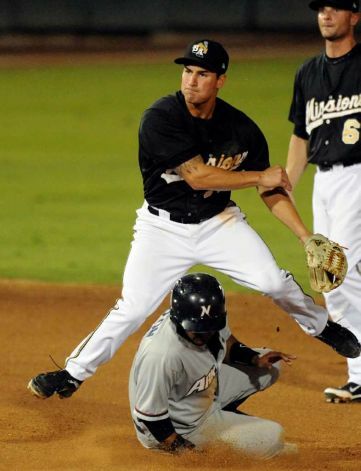 San Antonio Missions’ infielder Dean Anna turns a double play. Roberto: How difficult is it to remain engaged in the game when you play nine innings night after night? After all, isn’t baseball a game that can change instantly with one single pitch? Roberto: As an infielder, do you communicate with your outfielders on the field? Dean Anna: Yeah, you know, the right fielder and me (second baseman). We talk pretty much with every batter. We kind of know where we are going because I know if he is playing shallow or deep. Especially on guys, right-handed hitters, that maybe stay inside the ball well and hit the ball good to right field. We’ll know that he should be coming in a little shallow. So I kind of know that we’re not going to blow into each other, you know. The tough ones are when the ball is kind of sinks into center, like right center or left center. That means that you have all three players running at it. And that’s when it gets confusing, where the communication gets confusing. But with right field and second base, we’re okay out there. We kind of know where we’re staying. Roberto: Were you hurt being selected as a late round draft instead of an early pick? Dean Anna: No, you know, it didn’t bruise my ego at all. I was just happy to get the opportunity to play pro ball. That’s what I have always wanted to do. And you know I was going to give it my best, and I’m doing pretty good right now and stuff like that. I just wanted to have a chance, an opportunity that ‘s all you can ask for in life actually. So I’m just happy for that. Roberto: Are you ready to be called up to Major League Baseball by the Padres? Dean Anna: Yeah, I mean I’m definitely ready if they’re ready, you know. But I’m just playing ball and having fun. It’s day-by-day. I mean I have no control over any of that stuff. I wish I was a psychic. Yeah, that would be real nice. That’s fully out of my control. I just take it day-by-day. I play as hard as I can, and you know hopefully good things will happen. Ex-Mission and current Padre reliever Miles Mikolas holds up his championship ring for the fans. Roberto: Do you stay in touch with all of your teammates who have made it to MLB? Miles (Mikolas), (James) Darnell. Those guys had a great time, they’re having fun up there. They said it’s an unbelievable experience, you know their first-time, their first game. Hopefully one day I can get the same feeling. Roberto: Are you prepared for all of the rookie pranks that go along with being in MLB? Dean Anna: Yeah, hey, if I can get to the big leagues they can prank me everyday (laughter). Yeah, I’ll be the prank guinea pig. I don’t care (laughter). Roberto: Do you think being five-foot-eleven and 180 pounds puts you at a disadvantage? Dean Anna: I mean the size for me…it doesn’t really matter. Honestly, I feel like it’s not like football or basketball where you have got to be 6’6”, you got to run a 4.2 forty. Baseball is such a mental game and if you can just read between the lines well. I mean a smart baseball player…that will make you look better. Just being a smart baseball player, I think plays a big role in all that. Roberto: Don’t you think that being a left-handed hitter has its advantages? Dean Anna: Yeah, that definitely helps a little bit for sure. Get down the line a little quicker. Roberto: Having only reached double digits in the stolen bases category early in your professional career, why don’t you steal more bases with the speed that you possess? Dean Anna: You know…I’m not a big steal guy, but I have real good anticipation like when the ball is hit. I can tell if the ball is going to drop or not without looking. Like I just know that I can probably get (from) first to third with a line drive and know that the fielder is not going to catch the ball. I just got good instincts. Roberto: Where did you pick up this talent? Did good coaching have anything to do with it? Dean Anna: Yeah, definitely great coaching helps out…you know. After a while, you just get a feel. You know how the ball sounds off the bat. You know where the ball’s going. You just kind of get a feel for the game when you play for a while and start getting a rhythm. You just kind of know. Roberto: Who did you used to follow before becoming a part of the Padres organization? 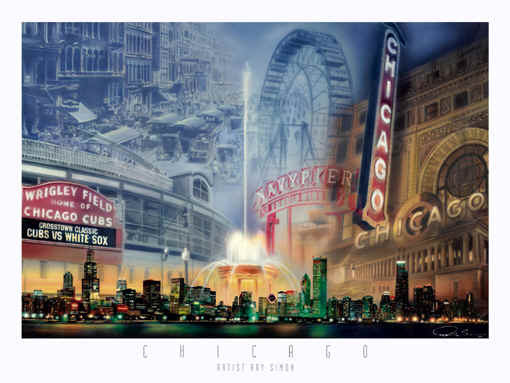 Dean Anna: I’m a Midwest guy from the Chicago suburbs. My family is all diehard Cubbie fans. Yeah, it runs through our blood. Roberto: Do you have your suitcase ready to go if you get called up next month? Dean Anna: No, my bags are not packed. Honestly, I’m just taking it day-by-day. If that does comes…that opportunity…I would be so happy, you know. I’m just excited to see what happens. Roberto: Excited to get pranked? What has happened to you so far in the minor leagues? Dean Anna: When I was in High-A, everyone knows that I don’t like animals and stuff. Roberto: With your fear of snakes, did you cringe when you learned that former teammate Miles Mikolas ate a live lizard in the Arizona Fall League bullpen? Dean Anna: I texted him that same day when I heard and asked him what he was thinking. He said it was funny and good protein intake. Roberto: What is your biggest baseball taboo? Dean Anna: I’m a big guy where I don’t want anyone to touch my baseball gloves. I don’t like anyone putting their hands in them. Roberto: Do you have a pre-game routine that you follow? Dean Anna: I like to really relax like for an hour. Get off my feet and just relax. Listen to my music. Calm down, you know, relax. Get mentally prepared for the game. Roberto: What about your routine at-bat and in-between pitches? Dean Anna: My ritual when I go up to bat…I always do my batting glove thing. Like every pitch I do this one batting glove, I tighten my left one up then my right one up. Then I touch the two outside corners of the home plate. Then I get ready to go. I feel like in baseball you’ve got to be consistent to move up. So everything I do I make sure to do the same way. Just because your brain works that way, you know. Your brain works like if you do the same thing it should trigger something. 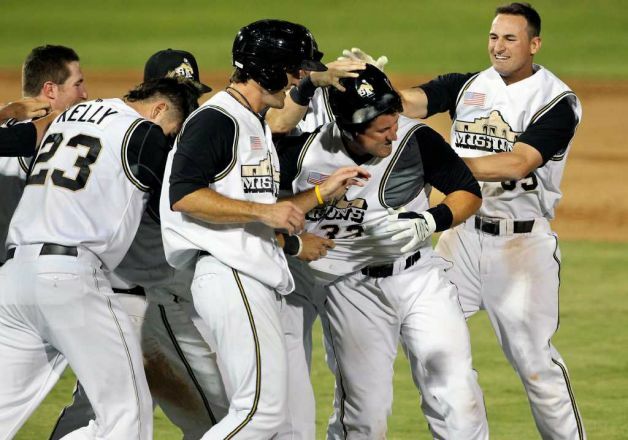 Dean Anna celebrates with his teammates after a walk-off home run blast by Jason Hagerty. four times in the same game? Dean Anna: If I got the golden sombrero, I would change what I ate that day. Like if I had bad games, I make sure that whatever I ate that day…I wouldn’t eat it the next day. I make sure that I wouldn’t wear the same shoes to the field. Like I’m a superstitious guy a little bit. Just because this game makes you kind of like that.. But when I’m going good I’m eating the same food everyday. I’ll walk the same way. I’ll take the same path. Just because it’s just a mindset thing. Roberto: What is your personal professional best hitting streak to date? it was getting bad where people were asking ‘What are you doing?,’ you know. But I wish it could have gone a little longer. Roberto: Are you happy to have been part of the San Diego farm system? in High-A Lake Elsinore. We actually went out for a game and everything was beautiful. Everything was so nice. Hopefully one day I can play there and get my chance. Dean Anna: When I was at Fort Wayne, it was nice because I have family out there that way. So I saw my family a lot. Roberto: Did the humidity and heat in Indiana prepare you for the weather you are now experiencing this summer in the Texas League? Dean Anna: Nothing compares to San Antonio heat. Honestly, it’s very hot out here! Lake Elsinore Storm when it’s over 100 degrees outside at game time in San Antonio? Roberto: Southern California weather is hard to beat. Wouldn’t you agree? Dean Anna: Yeah, yeah…it was nice, very nice! Beach Boys meant when they wrote ‘California Girls’? Dean Anna: (Smiling) Yeah, it makes sense! Roberto: Thanks for your time and sharing so much with us today. Dean Anna: It was a great interview. It was fun. It was great—thank you! Glad I am a Padres fan! Love the interview! Dean Anna is very humble! Watched a few of the games! He’s really good in the outfield! Can really hit that ball.